The Hi Fli (aka The Sound Freak) was designed by David Cockerell in 1971 for EMS. He later went on to design many of the classic Electro Harmonix effects (both the Micro Synth and Small Stone phaser are inspired by the Hi Fli). Only 350 were made making it a collectorâ€™s gem. David Gilmour bought a prototype in 1972 and from what he recalls it was â€œvery, very expensiveâ€. The Hi Fli was actually referred to as a synthesizer in the original ad, but itâ€™s basically an analog multi effect processor, which can be used on vocals, guitars and organs. It has two footpedals, which could be routed as control voltages/expression pedal to any of the slider functions. Itâ€™s got no memory to bank up settings, – everything is in real time, so one had to manually tweak the sliders for each tone change. 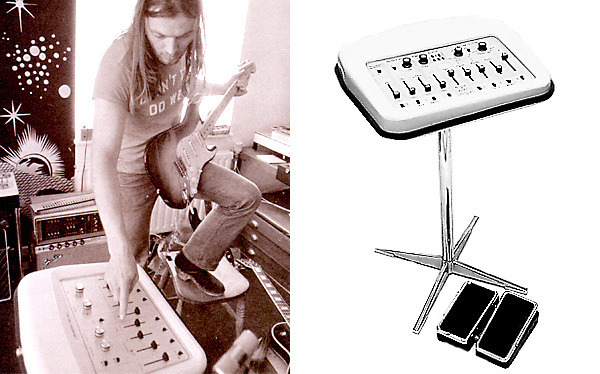 - (left) David pictured in his home studio in 1972 with a prototype of the HiFli. (right) The EMS HiFli with stand and original pedals. Ring Mod: Produce an octave higher when a signle note is played and the typical ring modulation when two or more strings are played. Bypass Mix Fader: This central slider controls the mix of the original and treated sound. In the high position only the input pre-amplifier is in-circuit. The bypass footswitch gives instant access to this position. The output from the Octave shitft, Ring Modulator and Fuzz Sustain sections are re-combined and go to the phase filter and modulator section. Treatment Selector: There are six distinct modes of operation – Vibrato, two modes of Phasing, normal WAA-WAA (1 resonant peak), WAW-WAW (six resonant peaks) a completely new sound, and finally MEOW (two sets of three resonant peaks moving in oppisite directions. Modulation Ramp Time: Operates in positions 3 to 6 of the conrol modulation selector. L.E.D selectors: Two light emitting diodes show the movement of the modulation waveform. It’s not documented when David got/bought the Hi Fli but assumably sometime medio 1972 as it was featured on the Dark Side of the Moon recording sessions. The Hi Fli was also featured in David’s rig during the brief US tour in March 1972 and at Earlâ€™s Court, London in May 1973. Itâ€™s not documented which songs he used it on, but it might have been for creating auto wah effects on Any Colour You Like and fuzz on live versions of Time. The Hi Fli is still in Davidâ€™s possession and was last seen at the Interstellar Exhibition in Paris in 2003/04. Information gathered from ems-synthi.demon.co.uk, â€œAnalogManâ€™s Guide to Vintage Effectsâ€ by Tom Hughes and the David Gilmour Gear Forum, post written by HiFli owner â€œRichardâ€.